Russian Defense Minister is expected to abolish the brass-buckle army belt, which became a dangerous weapon and object of fetish. New Minister of Defense Sergei Shoigu is continuing his reform of the Russian army. His latest initiative is to eliminate the brass-buckle army belt. A dangerous weapon, status symbol, strangling tool, tourniquet and object of fetish, the belt will soon become a thing of the past. “The new service uniform approved by Minister of Defense Sergei Shoigu does not have the belt. They will be completely absent from the new uniform. Some belts will be taken to warehouses, and others will be sold. Soldiers will stop wearing them by the end of the year — especially over vests. That’s what the minister has decided,” a source in the ministry told Izvestia. The Russian army is switching to a new uniform — which is almost the exact copy of the American uniform — and no belts will be required for the vest. Back in the 1980s, during the war in Afghanistan, Soviet army generals were already saying that belts were not required at all. It was then that bulletproof vests were introduced: putting a belt over such a vest was simply uncomfortable. 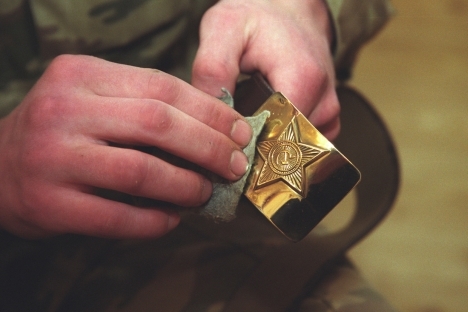 The army belt as we know it now appeared after World War II: a strap of robust artificial brown leather (there are genuine leather belts as well, but you really had to go out of your way to get your hands on one back in Soviet times) and a brass-hook buckle with an embossed star on it. The belt was worn over a jacket or shirt, with weapons and ammo attached to it. Owing to the hook, the belt took seconds to both put on and take off. The belt was a real Soviet multi-tool and a versatile army instrument. Durable and quite heavy, it was a lethal device for attack in any fistfight; it was even sometimes used as a whip or flail. This 9-minute-long video, narrated in Russian, shows how you can take off the army belt and hit an opponent before he even understands what is happening. The belt used to be a status symbol for servicemen. A new recruit had to wear his belt tight; old-timers who were weeks away from demobilization earned the right to slacken the belt, leaving the buckle somewhere close to the groin. The belt also came in handy when soldiers had to tie up a prisoner — especially if they had pliers, a magazine case or any thick stick handy. As the video explains, using the belt this way put the prisoner in so much pain that he would not even consider trying to remove the makeshift handcuffs. Of course, the belt was also used for non-combat purposes, as a tourniquet to suppress hemorrhaging, a harness for mountaineering and many other things. However, universal military service and barbaric child-rearing practices have turned the belt into a tool for punishment and an object of fetishes. The belt will now become a thing of the past. The pouches that were attached to the Soviet belt will now be replaced with a set of harnesses. The new nylon belt adopted for the new uniform will have neither charisma nor versatility.